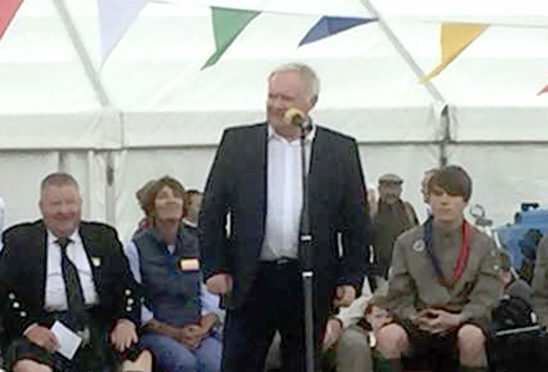 Joe Harper paid an emotional tribute to his late friend, and Gothenburg Great, Neale Cooper as he opened this year's Oldmeldrum Highland Games. Thousands of people turned out at the Pleasure Park on Saturday armed with rain jackets on what proved to be a break in the spectacular sunshine the region has been enjoying in recent weeks. The Dons’ record goal scorer Joe Harper was given the honour of opening this year’s event. He was introduced by the games event chairman Doug Petrie who recounted how he had wept when the forward had left for Everton in 1972, ending his first spell at Pittodrie. The King of the Beach End thanked the games committee for inviting him and then admitted he had considered cancelling following the unexpected death of his close friend last month. He said: “We lost a boy that I considered a second son, I knew Neil when he was 12-years-old. “When he came to the club his father had died and I took him under my wing. It was really hard to lose him. “I spoke to him before his death and told him I had been asked to be here and he told me about when he and the rest of the Gothenburg Greats opened the event in 2005 and what a great day it had been. Meanwhile locals and visitors alike enjoyed a wide array of traditional Highland Games events, from the heavy competitions to Scottish dancing. There was also foot races, including the popular 5 Miler, as well as athletics contests like the high jump. There was also an exotic flavour to the event with the Yee’s Hung Ga welcomed back to perform a traditional Chinese lion dancing display. And Wrestlezone brought their brawling and high-flying squared circle antics to the park, packing out the marquee. The day was capped off with Ollie’s Nightfever Disco. Gordon Forsyth, games secretary, said there had still been a healthy number of visitors despite the poor weather. “We had a really big crowd in earlier on which was good, as a lot of people were chased away to shelter later on,” he added.